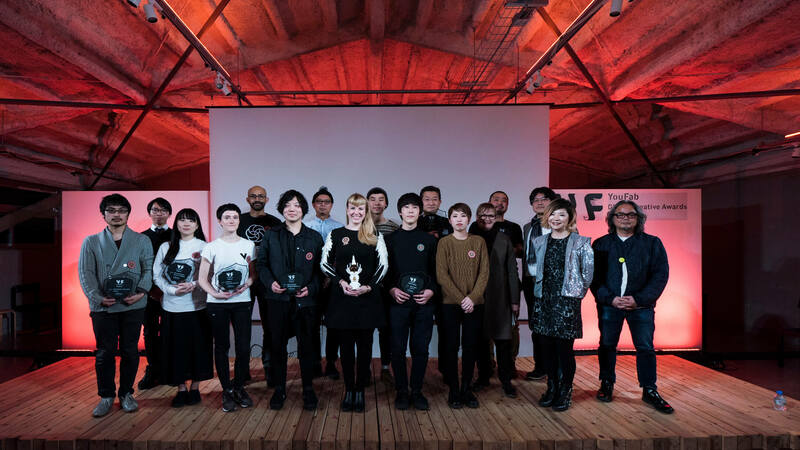 The YouFab Global Creative Awards is a digital fabrication award given by the FabCafe Global network, which is located in 10 cities all over the world. 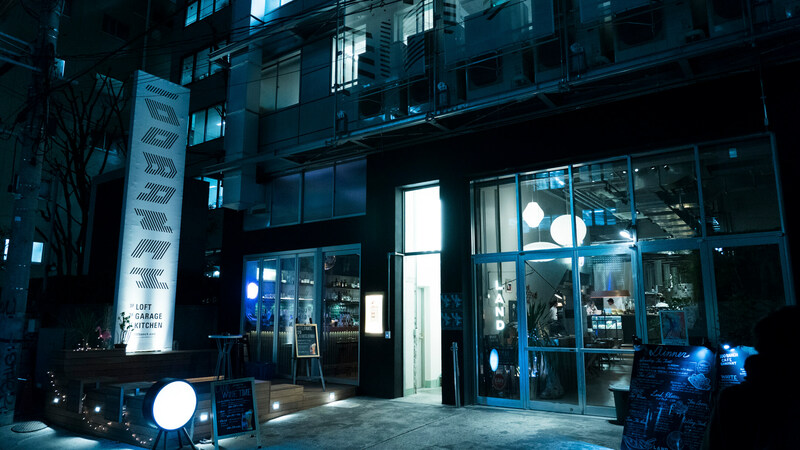 On February 19th, 2018, the awards ceremony for the YouFab Global Creative Awards 2017 was held at 100 BANCH in Shibuya, Tokyo. 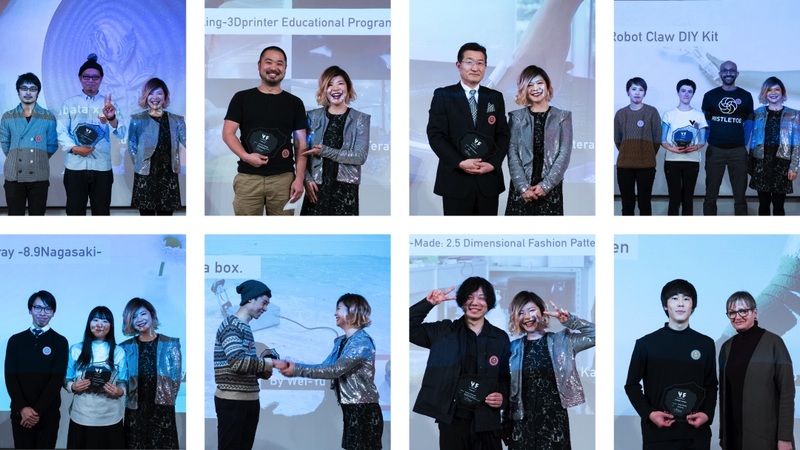 2017 marks the 6th year of the YouFab Global Creative Awards, which has walked in parallel and simultaneously contributed to the explosion of the Japanese digital fabrication scene. From 2016, YouFab has refined Fab as “the creativity that crosses and combines both the physical and the digital.” Fab doesn’t stop at making things by using digital data, but rather has grown in scale towards an effort to discover new and innovative creations. The following will cover a two-part report of the day’s events, including a three-part awarding of the 20 chosen pieces, a presentation from our Grand Prize winner, and a panel given by our judges. Entries embody the spirit of ROCK IT! The venue of the YouFab Opening was held at the recently built 100 BANCH. 100 BANCH is a collaboration space constructed in collaboration with Loftwork by Panasonic, which is celebrating its 100th anniversary in 2018. 100BANCH has been created with the intention of acting as a base for development of design with the next 100 years in mind. 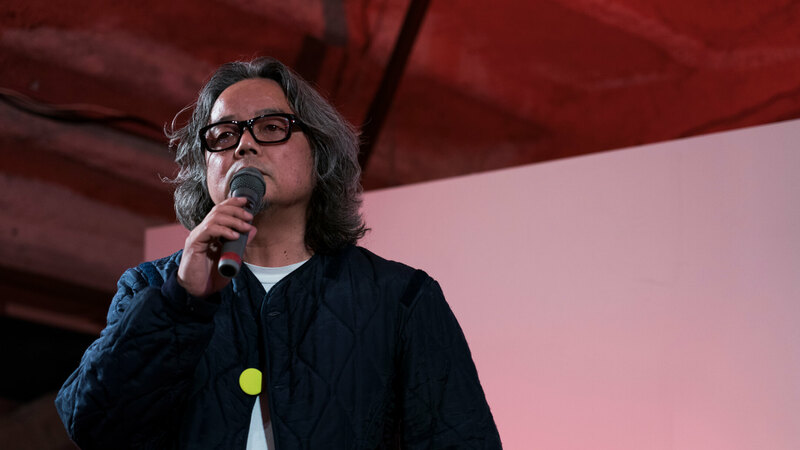 The event started with some opening remarks from YouFab’s chairman, Toshiya Fukuda. YouFab 2017’s theme is “Rock It!”. This theme embodies YouFab’s spirit of supporting work that challenges conventional wisdom, deviates from the easily known context, and steps forward resolutely towards a territory still unknown. This year also saw many selections that not only fit the theme, but contained within them a will to pioneer new possibilities with digital fabrication. During the first part of the awards ceremony, award certificates were conferred upon the 20 works that passed the judges’ rigorous examination. These 20 winning work were chosen out of 277 applicants. Among the winning works , it was felt that many contained an ambition born out of an awareness that posed intriguing questions to society that showcased rich creativity and scalability while using Fab technology as a base. Efforts to cross biology and architecture with Fab technology also stood out. The assembled works composed a lineup that symbolized having entered into a new phase of digital fabrication. The night continued with the conferring of the Student Award, the General Award, the Haptic Design Award, and the finally, the First Place Award and the Grand Prize. To the First Place and Grand Prize winners, certificates and trophies were presented. 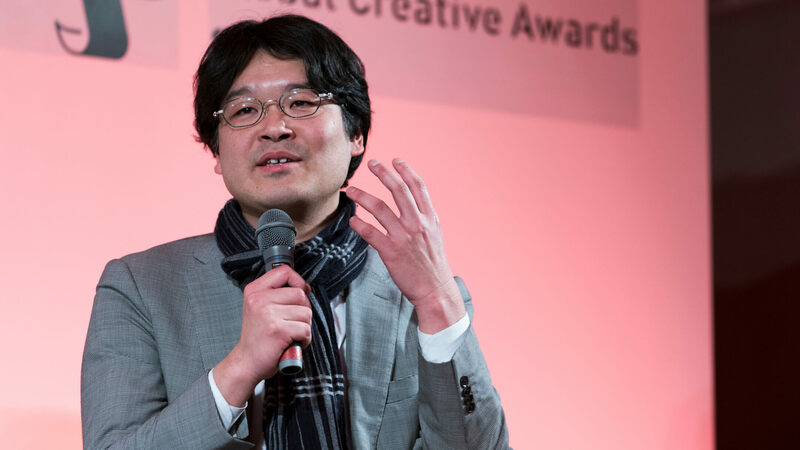 This year’s trophies were made again by the Japanese sculptor Kohei Nawa, who is active both domestically and internationally. 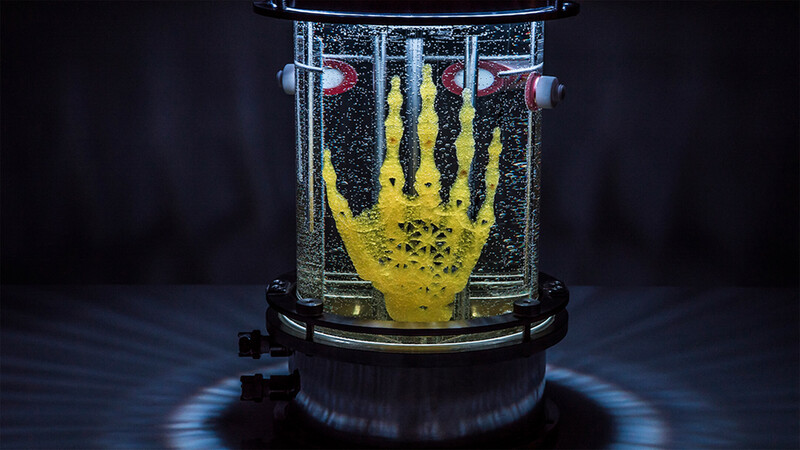 The trophies were produced by making full use of detailed 3D printing technology. 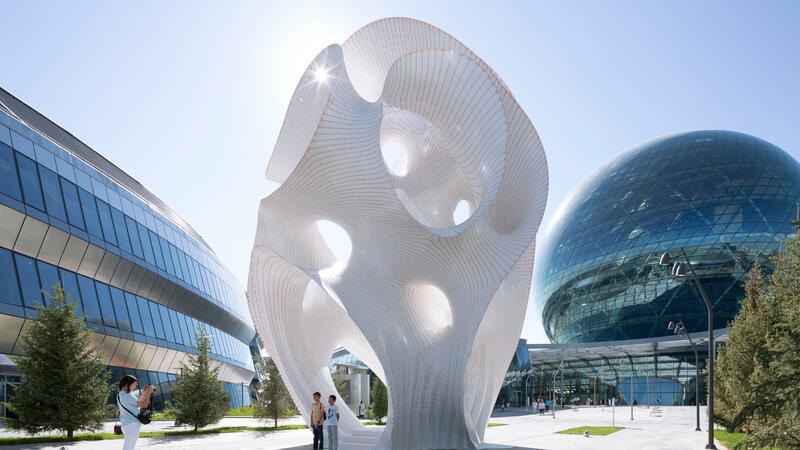 The first prize went to American Marc Fornes’s “Minima | Maxima.” The work was completed on commission for the World Expo 2017 in Astana, Kazakhstan. The material used in “Minima | Maxima” is aluminum and only 2mm thick. Fornes’s construction was composed of approximately 5,300 aluminum plates, cut long and narrow, combined in three layers similar to weaving a wicker basket. The curved surface, modeled finely with 3D modeling, manages to both retain its strength while also sketching numerous beautiful curves, creating a structure of curves which mutually support each other. For that reason, regardless of the fact that the structure is gigantic, reaching nearly the height of a four-story building (approximately 13m), it stands on its own, with no need for pillars or beams. With regards to the exterior design, the structure, and innovation with its materials, the work was rated highly for its dynamic and ambitious expression of the potential of digital craftsmanship, and it was thus chosen as the First Prize winner. The goal of a reliquary is to preserve the dead by enshrining flesh from which life has vanished. In this way, a reliquary becomes a monument to life itself. 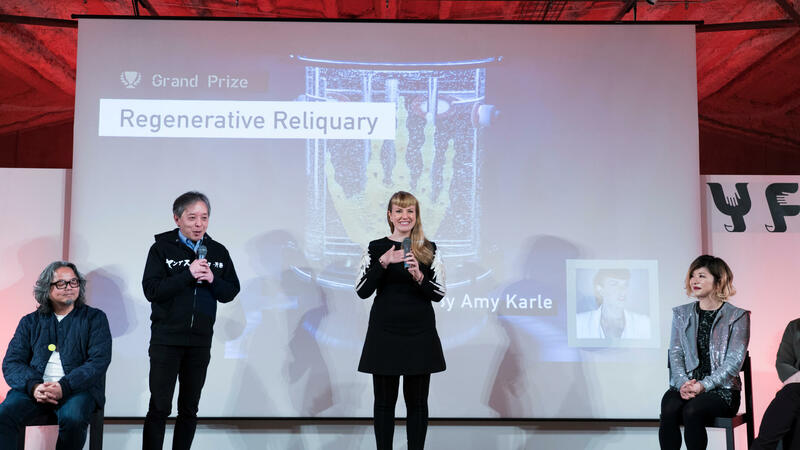 In her work, however, Karle proceeds in the opposite direction, challenging with a philosophical theme of “bringing the potential of life forth from an inanimate object which was originally lacking life.” Through its combination of biotechnology, art, and Fab technology, Regenerative Reliquary is a monumental work that will leave a large impact on the history of YouFab. A group photograph of everyone that participated in the awards ceremony. Once more – congratulations!